Diaper bags are an indispensable need for every parent. As soon as you enter this phase of your life, you bid farewell to the fashion fanatic inside of you because you have to carry around obnoxious looking diaper bags everywhere. However, this is not entirely true because manufacturers have already thought of the fashionable moms and developed some of the best designer diaper bags. What is better is that most of these bags are not only trendy and stylish, they are also functional. If you are itching to shop for such kinds of diaper bags, we have found three products that might just suit your needs and style. We have evaluated their features and determined their pros and cons so that it will be easier for you to pick one. So, keep rolling and read ahead to choose the one meant for you. Whether you want to take your baby outside for a stroll or you need to meet your friends, our picks will ensure that you never have to compromise on your panache, whatsoever. Amp up your style and grace with the Harrito Diaper Bag that is not only chic but equally or more practical for every mother or father alike. Whether you are a new parent, planning to have a child soon, or an expectant parent, this is one of the best designer diaper bags you can get your hands on. 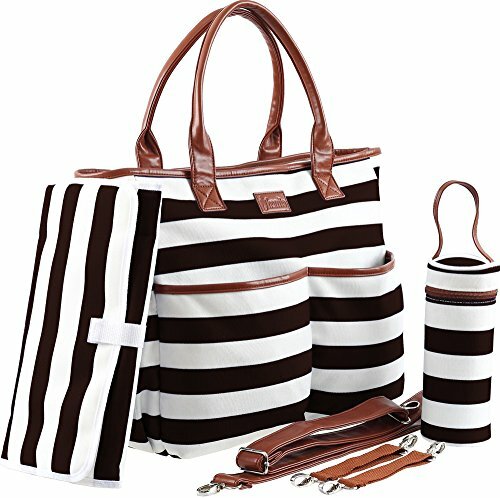 This 14 x 1.6 x 12 inches and 15.7 ounces tote bag features an attractive design with black and white horizontal stripes and brown leather holders that make it look more like an everyday carry bag than a diaper bag. In addition to its gorgeous look, the bag is quite roomy as well and can accommodate everything from diapers to feeding bottles. With the bag’s ten inner and outer pockets, you can always be sure you have enough space to put all of your personal belongings separately, be it your credit card, keys, wallet, or cash. What is more interesting is that the bag is highly durable and can endure everyday usage without easily wearing or tearing. Another great thing about this diaper bag is that you do not have to spend hours cleaning it because it is machine washable. So, there is literally no hard work involved on your part. For more convenient use, this bag can also be dangled to your baby’s stroller, which allows you to keep your hands free. The bag also includes a diaper changing pad, stroller and shoulder straps, and a bottle holder. This MB Krauss bag is another beautifully crafted designer diaper bag in tote style. 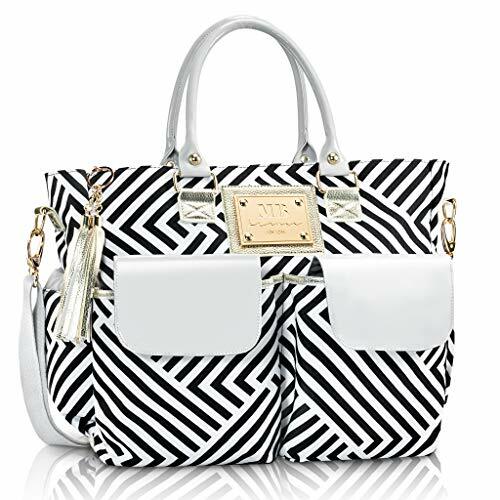 With its diagonal streaked design, this bag does not look anything like a conventional diaper bag, and you most certainly can use it as a casual or professional bag as well. The color combination of this bag is pretty much same as the Harrito one, but it also includes grayish silver on its exterior flap pockets and straps. This is made of a high-quality, flexible, and water-resistant material, and the strap has an ergonomic design. The bag, as a whole, is specially designed to safely hold all of your baby’s accessories including diapers, feeding bottles, and wipes. Your child’s pacifier can also be easily carried and accessed since this bag comes with a pacifier clip. This 5.5 x 15 x 13 inches and 2.6 pounds bag features ten different sized pockets that have plenty of room to keep everything organized. This bag also comes with a changing pad that closes up to become a small clutch that has compartments for diapers, cleaning wipes, and rash creams. You can swing this bag on your shoulder or fasten it to the stroller with its additional straps. The zipper does not close completely. 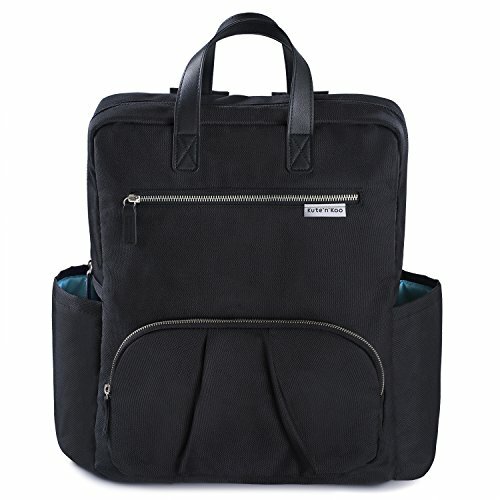 Unlike the two diaper bags above, this bag comes with a stylish backpack design that will grab the attention of all the onlookers but will never be taken for a diaper bag. This bag has a size of 12.5 x 6 x 15.5 inches and weight of 1.1 pounds. It is made of heavy-duty, waterproof, and BPA-free fabric that inhibits moisture from seeping in or dripping out. It is also equipped with ergonomically designed, foam-padded straps that are adjustable. Likewise, the back of this bag is also cushioned to provide comfort and support. In addition, it also comes with a PU top handle. Compartment-wise, this bag has 12, wherein one is large enough to fit your laptop, tablet, baby blankets, or other space-consuming stuff. Another one is a quick-access top pocket that you can use for keeping your cash, wallet, keys or anything else that you may need urgently. On the sides, there are two pockets wherein you can place your baby’s feeding bottles or thermos. On another note, this bag also comes with a lifetime warranty that does not only secure your investment but also ensures that it will last you for quite a while. So, the gist of it all is that a diaper bag does not necessarily have to be hideous and uncomfortable and that’s quite evident from the options we stated above. All of our above-mentioned picks are excellent at serving their purpose, but if you want a total winner, you should go for the Harrito Diaper Bag. With its extremely resilient construction, from top to bottom, chic design, spacious storage, and comfortable holding straps, this gorgeous bag will have all the parents drooling over it wherever you go. So, keep on rocking your style and never settle for anything lesser.